The film is being produced by Ram Gopal Varma himself under the banner ‘Company’ and is yet to be titled. Filmmaker Ram Gopal Varma will collaborate for his next with Akkineni Nagarjuna in Telugu and the shooting of the film will kick off today in Hyderabad at the same studio where his first film – Shiva – was shot. The film is being produced by Ram Gopal Varma himself under the banner ‘Company’ and is yet to be titled. Nagarjuna had confirmed that he will be playing a cop in the film and the story is an intense one. 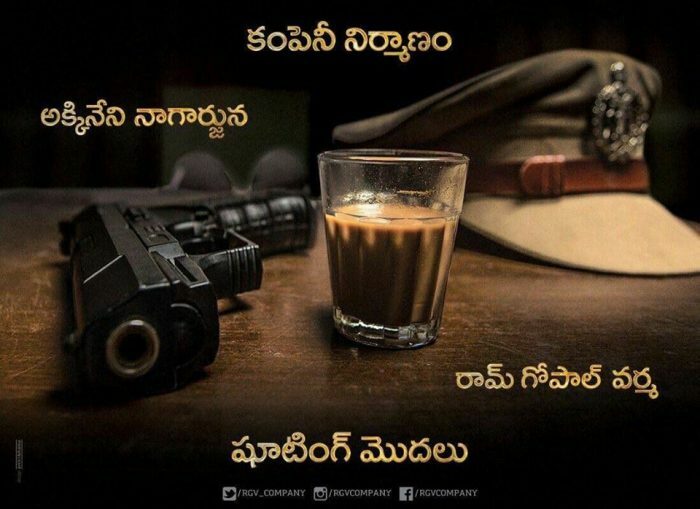 Ram Gopal Varma shared an intriguing poster of the film marking the beginning of the shooting of the film today in Hyderabad. “Shoot Begins! #Company’s Production No 1 In Telugu with Akkineni Nagarjuna directed by RGV Produced by #RGV and Sudheer Chandra #NAGRGV4,” wrote RGV on his Facebook page along with the picture. RGV seems quite excited about his project with Nagarjuna and has been saying a lot about it lately. This will be the first production in Telugu for Company which is owned by Ram Gopal Varma. Just a day before the shoot, Ramu had posted an emotional message about the film which read, “My first film Shiva was inaugurated by my father and Akkineni Nageshwara Rao garu and my new film’s opening will be done by my mother and my first producers Akkineni Venket and Yarlagadda Surendra. Yes, I also get emotional and sentimental once every three decades.” The makers are yet to announce the details of the rest of the cast in the film which are expected to be revealed today at the official launch of the film.